The arrival of the paradigm-defining iPad, the best iPhone to date, and strong rumors of a renewed entry into the digital TV market, 2010 may be Apple‘s best year ever. May be. Because Apple has serious issues to tackle. A special report at AppleInsider digs into Apple’s recent and historical financial details, and shows how its business operations are converting into raw profits. The facts of Apple’s recent successes are well known–its stock market value makes it the second largest U.S. corporation, beating Microsoft–but exactly how much will the company’s earnings grow this year? It’s a big question. 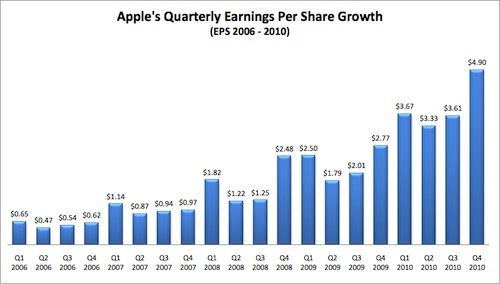 The analysis reveals that Apple may well achieve a 70% growth in earnings for 2010, compared to 2009. Gross margins are projected to peak at 41.9% in the fourth quarter, driving earnings per share to a record $4.90 at the same time–a figure ten times larger than the middle quarters in 2006. These figures are incredible, and they lead to one conclusion: If this growth is sustained into next year, at some point in 2011 Apple will surpass Exxon and become the largest U.S. company (as measured by market capitalization). It’ll have a strong portfolio of market-defining products, multiple revenue feeds from a host of tightly controlled businesses, and a war chest of well over $40 billion in cash stored up, primed for acquisitions and R&D. And remember, this is a company that was all but pronounced dead just over a decade ago. Success has thrust the company into the limelight–and people hate to see a winner. It’s true. Just look at the other companies that top the stock market: Exxon, Microsoft, and Walmart. Not exactly the most loved companies in America. Apple was a media darling and man-in-the-street favorite because it was the new, lateral-thinking, risk-taking underdog to Microsoft’s overdog (complete with rabidly evil competition-squashing business habits). In an era of ever-increasing PC power, boring big beige boxes and user-hostile software, Apple launched the iMac and then the iPod, changing desktop computing and mobile music forever: They were weird little products, sneered at by industry insiders for their high prices and choice of form over function. Then Apple reinvented the music biz with its iTunes store, and smashed apart the entire smartphone device genre with the iPhone. Everything Apple made was instantly desirable to the consumer, and the media in general fawned over every aspect of the Apple magic. Consumers do still love Apple’s products, but in recent months the media has turned against it. The closed-door management of the iTunes App Store has caused huge controversy, and the recent Adobe Flash fiasco has resulted in a complex media storm of disapproval–and rumblings from the EU government. With the recent issues about the iPhone 4’s alleged antenna woes, Apple has earned its worst press in decades, and its tight-lipped PR responses haven’t helped (neither have the surprisingly candid emails from Steve Jobs). Apple has become “The Man”–an oppressive, dictatorial tech giant, forcing consumers to bend to its will, and callously hooking users into its ecosystems so they have little choice but to buy the next-gen device when it launches next year, handing over yet more fistfuls of dollars for the privilege. challenge, as it cements its market successes and grows even larger. But there’s another seemingly tiny issue that Apple will have to tackle somehow if it is to continue its trend of market-defining product innovation: Device complexity versus the average user smartness level. I’m not talking about how easy it is to use Apple gear–it really does live up to the “it just works” model. I’m talking about the fact that Apple’s tech is at the very margin of complexity that the average user can understand, and perhaps slightly beyond. 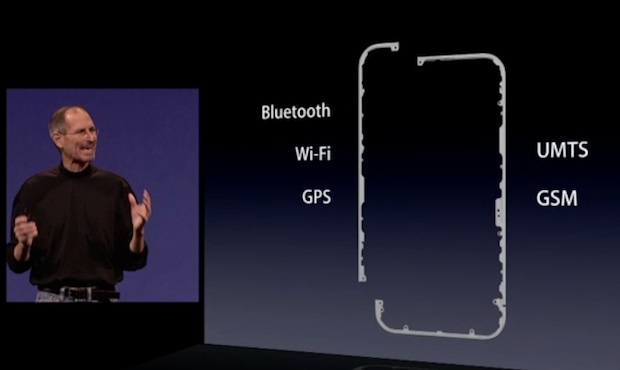 The biggest highlight shone on this issue is the recent iPhone 4 antenna affair. Apple’s new phone works like every other cell phone, in terms of radio antenna design, with one exception–you can touch the iPhone 4’s antennas. And it’s been demonstrated that one can seriously affect how well the iPhone communicates by gripping these antennas in a particular way. Or has it? Because every cell phone is affected by how you hold it, and some Nokia phone manuals even explain how one should hold them for best reception. It’s just that until the latest generation of smartphone, users were never able to download apps to see this effect in action. Some segments of the media have been bad–mouthing Apple on the matter, and Apple has even admitted there is an issue with how the signal strength is displayed. But other users note that the new phone delivers better performance than before. The problem is that the iPhone is probably one of the most sophisticated devices many users have ever held in their hand. Its computer power trounces the Space Shuttle’s, and it’s a synthesis of cutting-edge screen design, battery design, component miniaturization, sophisticated radio frequency circuitry, brain-mashingly tricky digital signal processing, and user-accessible software units. It’s a miracle that the device–or indeed any smartphone like it, including high-end Android units–works at all. As a result, problems, or perceived problems, with how the device works quite definitely are beyond a “common sense” interpretation. And yet that’s the only interpretation the man-in-the-street usually manages. As Apple launches ever-more sophisticated devices, with complex cloud-based ecosystems to support them, it’s going to have to adjust its distant-feeling, slightly haughty PR practices if it’s to avoid problems with perceived flaws from a user point of view. It’ll have to explain, educate, and probably apologize more than it’s ever had to. It will also probably have to take extra effort so that it designs the complexity of future iDevices into invisibility–bringing the “it just works” model to new heights. This shouldn’t be a problem, though: It’s got the cash to let it do this well.